Uttar Pradesh known as UP is a state in North India with Lucknow as capital and Kanpur as the commercial capital. This states shares it border with Rajasthan,Haryana,Delhi, Uttarakhand,Bihar and Jharkhand.Uttar Pradesh cuisine is famous for it royal dishes. While Nawabs ruling this regions, the royal slow cooking generally used for rice and meat cooking with sealed containers for retaining flavors and juices calle Dum pukht got introduced in this Cuisine.A typical vegetarian meal of Uttar Pradesh consists of roti,rice,dal,sabji, raita and papad. On festive occations, usually tava,the flat pans for making roti is considered as not auspicious and they eat friedfoods. A typical festive thali goes for Puri,Kachauri,Sabji,pulav,papad,raita and desserts.The cuisine of Uttar Pradesh is just as diverse as its geography. Ranging from simple every day fare to rich, elaborate banquets, the cuisine of Uttar Pradesh has absorbed and adapted a variety of cuisines to create wonderful dishes.. Each city offers a different but equally inviting cuisine for the gourmet.Awadhi and Mughlai cuisine are the two prominent cuisine of this state. Delectable delicacies like chaat, samosa and pakora, that top the most popular street food charts in all of India, are native to this state.Awadhi cuisine spread consists of elaborate dishes like kebabs, kormas, biryani, kaliya, nahari-kulchas, zarda, sheermal, roomali rotis, and warqi parathas. The richness of Awadh cuisine lies not only in the variety of cuisine but also in the ingredients used like mutton, paneer, and rich spices including cardamom and saffron.While Mughalai is strongly influenced by Persian cuisine of Iran and also have strong similarities with Kashmiri and Punjabi cuisine.ew famous dishes from this cuisiner are Bedvin this Indian flat bread known to have originated in Uttar Pradesh definitely satify your tastebuds. Paired with potato curry or chana (chole) its makes for a happy combination. Crisp and fluffy, the puris are made with whole wheat flour and urad dal while Keema dum ,kheema kebabs,mutton kofta comes from this cuisine, a prefect feast for non vegetarians. Arhar ki dal, a everyday simple classic food with dal a comforting food served with rice. 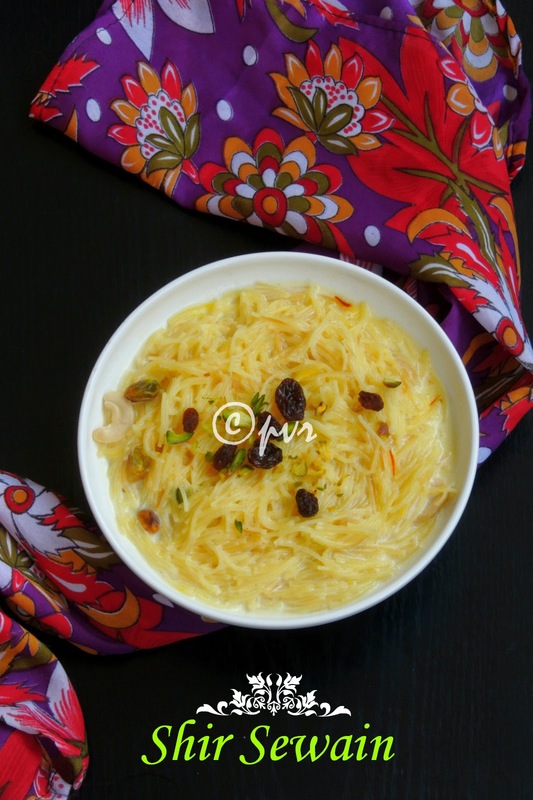 Every household have their own version of this dal.Shir sewain belongs to this rich cuisine which goes for roasted vermicelli, this shir sewain is nothing but a delicious vermicelli kheer tastes fabulous as dessert after having heavy foods. Add the milk and cook in simmer for few minutes. Now add the sugar, cook until the sugar gets dissloves and the vermicelli gets cooked. Finally add the crumbled khoya,saffron strands,raisins,nuts, give a stir,cook for few seconds. Put off the stove. Serve warm topped with dry fruits and nuts. What a wonderful and healthy dish. Lovely and delicious looking sewain. Wonderfully prepared. so similar to the semiya payasam, but I do not add khoya!! looks heavenly..
A little bit like the payasam, right? I think khoya gives a richer taste. Looks gr8! Adding of khoya will give it the richness. Nice one. Love that click..and the dish!..the khoya must be making it really rich,looks divine! Khoya, milk and sugar - rich and delicious. Nice pick. rich & delish..looks so yummy..i feel like having that bowl right away. Looks sinful with the addition of khoya! Lovely. What a rich and delicious dish. Wow!!! !such a delightful dessert,looks super tempting and delicious.. Simple yet yummy dish. This must be a popular one in the Muslim cuisine.